Stocked in depth we have hardened and plated carbon steel and stainless steel self-tappers for use mainly in sheet steel products. 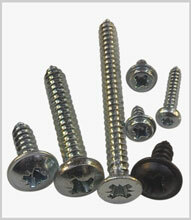 These screws form or tap their own thread so saving time and providing a strong clamping action with the ability to remove and replace if required. Countersunk, Pan, and Flange heads are commonly available, the flange head having the advantage of spreading the load well and minimising deformation of the sheet thus eliminating the need for an underhead washer. The slotted drive is still available but the modern preference is for cross recessed and multi-splined (star) drives to suit modern insertion equipment.